SALES&MARKETING(continued from page 71) take your time, and that is okay. If your statement is impossible to read your processor is hiding something, and it is probably an enormous bundle of fees you do not know you are paying. Once again, If your processor is unwilling to discuss fees or explain your statement, be wary. Number 5: You have an unreasonable monthly minimum. This one is also tricky. Generally, monthly minimums are indicative of high prices, and dishonest service. The exception is a situation when your processor sets you up with a monthly minimum plan because you absolutely and consistently process more volume than it takes to pay the monthly minimum. Because they set you up on this plan, they can waive or discount some other fees. This is extremely uncommon due to the nature of credit card processing rates. If your processor has done this, make sure they can explain it step by step. If they have explained it and you are having diffi culty understanding, they are probably hiding fees yet again. Ask someone you trust who understands processing, but consider shopping for a new processor. 76 Number 4: You experience consistently poor customer service. This one seems obvious, but it must be included. Poor customer service means your processor values profi t more than clients. Next! Number 3: Your processor offers "free" equipment. It's a trap! They lure you in with free equipment only to charge high rates and hidden fees. It always sounds like you will spend less because you will have low startup costs, but in the end you will pay for that terminal one way or another. Whip out your calculator and do the math, then start shopping. Number 2: Your equipment or solution only works with one provider. It's a trap! This one is worse than Number 3 because you cannot escape without buying new equipment, or paying a contract termination fee. Read your agreements before you sign up. Your customer service representative should be able to clearly explain every item of your contract. Furthermore, the more complicated your contract seems, the more you need to have it reviewed. International Door & Operator Industry™ Credit card processing is only a little confusing by nature. Extreme confusion is a sign of hidden unethical tactics or a disorganized business, both of which are indicative of a bad processor. 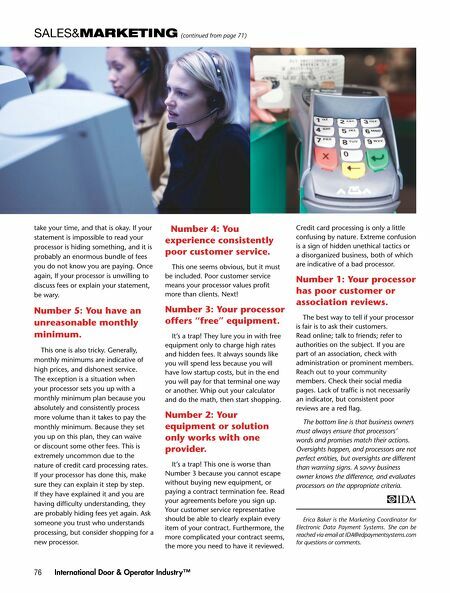 Number 1: Your processor has poor customer or association reviews. The best way to tell if your processor is fair is to ask their customers. Read online; talk to friends; refer to authorities on the subject. If you are part of an association, check with administration or prominent members. Reach out to your community members. Check their social media pages. Lack of traffi c is not necessarily an indicator, but consistent poor reviews are a red fl ag. The bottom line is that business owners must always ensure that processors' words and promises match their actions. Oversights happen, and processors are not perfect entities, but oversights are different than warning signs. 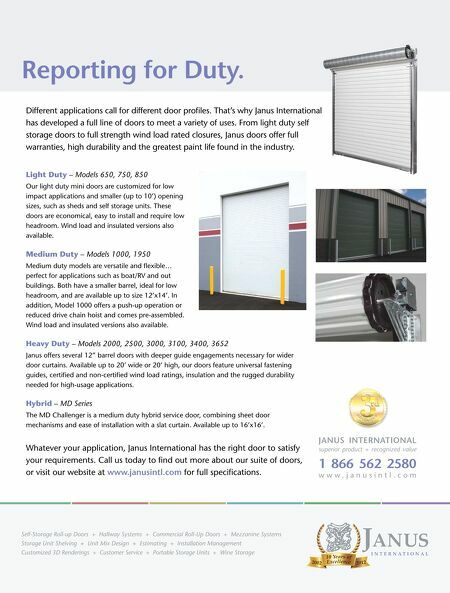 A savvy business owner knows the difference, and evaluates processors on the appropriate criteria. Erica Baker is the Marketing Coordinator for Electronic Data Payment Systems. She can be reached via email at IDA@edpaymentsystems.com for questions or comments.